Claim: Photographs show Jasmine, a greyhound who cares for other animals at a wildlife sanctuary. Well, that triggered my interest! The story is true. It’s about an abandoned and abused greyhound dog that was found by the police in a shed and taken to a animal sanctuary for care. Jasmine, as they named her, started adopting baby animals and caring for them. I totally believe this article! My girl dog, Nicki, does the same thing! The first time I saw it, was about ten years ago when I brought home a bunny. When Nicki saw the bunny, instantly her motherly “instinct” (hard-wired by God) got in gear and she thought she had just given birth. She started panting like she had just gone through an ordeal, and laid down next to the bunny, and started licking it all over and tried to get it to nurse. She licked and licked the Bunny, like a mother dog does to clean and stimulate the baby’s bodily functions. She and the bunny were like that for hours. I kept a good eye on them, though, because in the wild a bunny is prey to wild dogs. But, Nicki continued to think it was the bunny’s mother. We got Nicki when she was four months old. 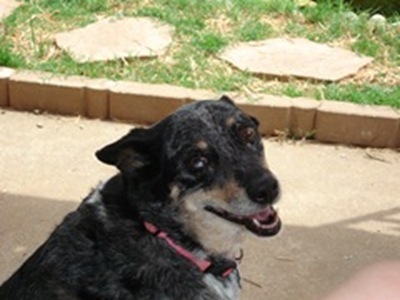 She was an abandoned mixed breed doggie that was left behind when a purebred Australian Sheppard kennel moved away. Now that she is grown, she looks like part Australian Sheppard and part Blue Heeler (her pointy ears from the heeler, we assume). We got her spayed as soon as she was old enough, so we know she had never had puppies. Nicki was my hubby and my first doggie together after we married. At the time we had no other pets. I recently had to put my nine year old doggie, Bo, to sleep because she was dying of immune mediated hemolytic anemia. Bo had been a big part of my life for the last nine years, and I really missed her. I was not ready for another dog. But, my hubby wanted a dog for the two of us once we got married. He finally won. So, this bunny was the second pet after Nicki, and Nicki thought it was her baby. After a few days, her maternal hormones calmed down. But, every time since, when I get a new pet, and there’s been lots of them, she kicks in to Mommy mode. Since the bunny, she has thought she has given birth to a box turtle, several goldfish and each bird I brought home. For the birds, I sit the cage down, and Nicki lays next to the cage as close as she can, trying to get the cage in the position to nurse. She pants and pants like she is wore out. (I had been a bird watcher for many years when I married my hubby. He suggested we get a bird. He didn’t realize the monster he would create by getting me my first pet bird.) So now, all of my pets are Nicki’s “Babies”. Nicki is as old as my marriage with my hubby. We figure she was born about the time we got married. So, she is a 12 year old doggie, but she still thinks she is a puppy. When she was young, she had a lot of psychological problems, and peed whenever she got scared, which was all the time. She has gradually grown out of it, but still gets scared a lot, (but doesn’t pee). I’m happy to have this forum to tell about my good girl, Nicki. I couldn’t resist after reading about that greyhound.